Hyams Beach in Jervis Bay is being 'destroyed' by tourists. Why people are being turned away from one of New South Wales' most iconic beaches. Thousands of drivers have been turned away from the NSW beach with the world’s whitest sand as the local council brainstorms solutions with residents over its booming popularity. Shoalhaven City Council has appointed traffic controllers to redirect visitors from the Hyams Beach village in Jervis Bay, given its parking capacity is 400 but up to 5000 vehicles are around each day during peak season. 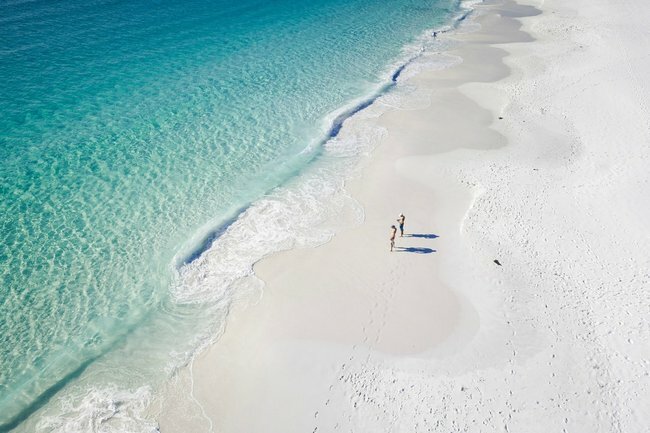 “It has been loved to death,” Hyams Beach Villagers Association member Lois Sparkes told AAP on Sunday, pointing to the tens of thousands of #HyamsBeach photos on Instagram. The south coast village of rental properties, resorts and about 110 permanent residents has one narrow road in and out, which has also raised concerns about access for emergency service vehicles in busy holiday periods. “The beaches are being damaged, in a way, because people are now coming here and if they can’t get somewhere to stay they are just illegal camping on the beaches, and the rubbish problem is quite concerning,” Ms Sparkes said. “Those who camp on the beach often light fires in the dunes and we are surrounded by national park. The council surveyed Hyams Beach ratepayers last year on short and long-term solutions to the area’s popularity. Ms Sparkes said there was quite strong support for “out of village” options such as car parks with combined walkways or traffic rationing against available spaces, and some support for paid or time-restricted parking. She said the traffic management arrangements, such as the vehicle limit, have worked “very effectively” to ensure a safer and better visitor experience on hot days when they are “inundated” with thousands of cars. The traffic controllers have also been giving drivers nearby white sand beach alternatives to visit in Jervis Bay. “Many people come here and rent properties and a lot of those people have actually said, compared to previous years when they’ve been here, it is a lot more orderly and a lot more calm,” Ms Sparkes said. She said the HBVA is looking forward to further and broader discussions with council on issues such as additional infrastructure, public amenities and pedestrian walkways.